The Football Association has launched a five-year plan aimed at making women's football the second-most played sport in the country. Currently 253,600 women footballers play every month and the FA hopes to build on this. We have to keep pace with the top female footballing nations both on and off the pitch. FA chairman David Bernstein said: "Women's football is the area with the most potential for growth in the nation's favourite game." It is behind men's football, cricket and rugby in its player count. Delivering a new commercial strategy for women's football to include more broadcast coverage to elevate the profile of the women's game. 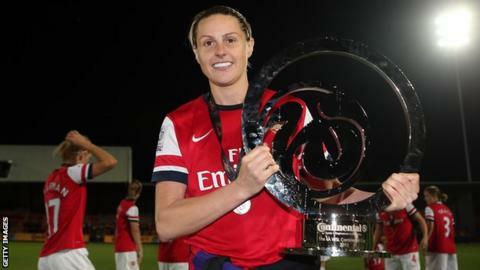 Expanding the FA Women's Super League by introducing a second division in 2014 to enable promotion and relegation. Bernstein added: "We are determined to lead development at every level and have created a robust plan for doing so using all our resources and knowledge." The FA is determined to build on the success enjoyed by women's football at the London Olympics, when 70,584 turned out at Wembley to watch Team GB defeat Brazil in a group match. Under the proposals, it will invest a further £3.5m into the women's game over the next four years to deliver the Elite Performance Unit and the expansion of the Super League, which recently completed its second season. The plan also states that, for the first time, broadcast and commercial rights for the women's game will be sold separately from the men's game to help promote women's football as a brand in its own right. "This is the right time to be developing commercial plans to bring new partners into women's football," said FA general secretary Alex Horne. "The standards of football are high and the international game is very strong. We have to keep pace with the top female footballing nations both on and off the pitch. This ambitious and wide-ranging plan sets out the basis of what we are trying to achieve. "We need partners who will work with us to raise our profile and really take the game forward. I'm convinced this is the right time for this plan to be put in place." England coach Hope Powell said she hoped the plan could help the national team move up from its current world ranking of eighth to challenge the likes of Germany, France and the USA. "This ambitious and wide-ranging plan sets out the basis of what we are trying to achieve," she told BBC Sport. "The FA wants to build winning teams and the establishment of the performance unit and the Super League Two will hopefully help our ultimate goal, which is to win something. "But we have to remember that the likes of Germany and France are doing things, too, and, at the moment, are ahead of us." Powell also reiterated her desire for Team GB to be represented at the Rio 2016 Olympics. While Horne acknowledged that the men's participation at London 2012 is likely to be a one-off, he said that the FA would look at the possibility of the women competing again. "For the men's game, the pinnacle is the World Cup, but for the women's game it's different," he said. "In my opinion, the women's Olympic tournament is the pinnacle. We are willing to talk to the home nations about whether we aim for 2016. It is on the agenda."